The Guatemalan foundation La Ruta Maya, in conjunction with Xipe Projects of Huntington Beach CA, is pleased to present Treasures of the Maya Spirit, an exhibition of Maya art from Guatemala that brings together roughly 51 ceramic and stone sculptures from the classic period of Maya civilization (250-900 AD), a number of significant examples of late nineteenth and early twentieth-century Maya ritual art, and several contemporary prize-winning works of art from the Guatemalan Bienale. Treasures of the Maya Spirit explores the evolution and significance of Maya religion in art and highlights instances in which their most powerful symbols have defined the meeting place of matter and spirit from the third century to the present. The treasures on display will include an amazing nine-foot long stucco representation of a masked jaguar dancer from Guatemala’s early classic period (ca. 300 AD) – a piece reported to be one of the centerpieces of the newly proposed Museo Maya de America to be built in Guatemala City. The exhibit also features several outstanding examples of dance masks and folk saints drawn from the collection of Xipe Projects. These masks represent the continuation and transformation of ritual mask use among the post-conquest Maya of the nineteenth and twentieth centuries and, as are many others pieces featured in the exhibit, among the finest examples in existence. The exhibit will open Thursday January 16, 2014 and run through Sunday, January 19, 2014 at the 19th Annual Los Angeles Art Show Presented by The Palm Beach Show Group in Tandem with the 29th Annual IFPDA Los Angeles Fine Print Fair. It is no accident that there are so many masks in Treasures of the Maya Spirit. For the Maya, the mask signified the point at which the world of the spirit could enter the material world. Their ritual spaces—temples and pyramids—were profusely adorned with masks of the gods, and the rituals enacted in those spaces were performed by masked dancers whose elaborate masks and costumes enabled them to “become” the gods for the ritual moment. One such performer is depicted in the magnificent sculpture included in this exhibit of a man wearing a mask with the features of a jaguar. But this is no ordinary jaguar; the mask’s features are actually drawn from several creatures of nature, and the result is a mask representing the world of the spirit in the way typical of Maya religion. 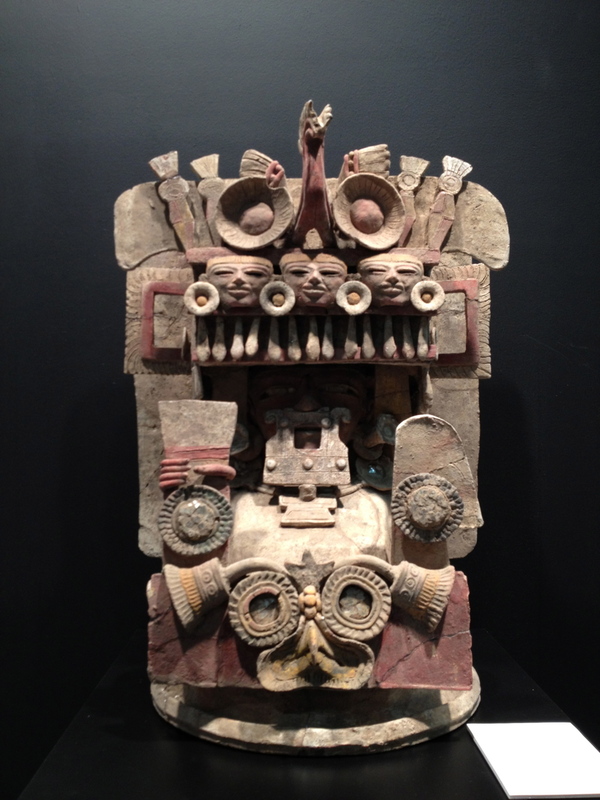 The image of the mask can also be found on Maya religious sculpture such as the numerous incensarios featured in this exhibit. The incensario literally turns matter—copal resin—into spirit, as the smoke which rises to the heavens. Like the mask, the incensario can be understood as a religious interface, the point where matter turns into spirit. Several of the painted ceramics to be featured this exhibit depict characters and scenes from mythic tales such as the Popol Vuh, tales that defined the gods and depicted their interactions with humanity. For the Maya, as for all Mesoamerican peoples, the continuation of the cycles of life on earth depended upon this interaction. The gods and humanity must each do their part so that life could continue. That is to say, the material world and the world of the spirit were inextricably linked. The Spanish conquistadores and the missionary priests who attempted to extend the European conquest into the souls of the Maya, found numerous ways to link pre-Columbian Maya religion to European Christianity as a way to convert the indigenous people. For example, they used Spanish folk dances, notably those recounting the expulsion of the Moors from Spain, to “replace” the ritual masked dance of the Maya. The most popular of those dance/dramas was the Dance of the Moors and Christians, an elaborate production that culminated in the King of the Moors converting to Christianity by pledging obeisance to the True Cross. In a widely popular later variant of the Moors and Christians, an elaborate dance/drama known as the Dance of the Conquest, the Moors are replaced by the Maya whose leader Tecum Uman is finally killed and the Maya converted to Christianity. These dance/dramas are generally performed in annual festivals dedicated to the patron saint of the village, and while they are not sacred, they are more than merely entertainment. Thus masked dance survives in a religious context among today’s Maya, and the masks in The Treasures of the Maya Spirit represent those used in that tradition. The missionary priests, confronted by the multiplicity of Maya gods, often presented Christianity as a religion of the saints. Each village had its patron saint, and these saints were housed in the church and celebrated in elaborate festivals, thus replicating the ritual activities of the pre-Conquest Maya. These activities continue in today’s Guatemala along with the existence of a number of folk saints who are not Christian in the European sense, but are tolerated by the Church. Probably beginning shortly after the Conquest, the Maya added several “saints” to the pantheon of Christian saints brought by the missionary priests. The most widely venerated is San Simon or as he is known by the Maya, Maximón. In this exhibit, he is depicted as a seated, dressed figure, from an inch or two tall to life-sized, such as those displayed here, often wearing a hat. His face is a mask that is sometimes constructed so that he can “smoke” a cigar and “drink” offerings of liquor. The offerings, of course, are meant to gain the saint’s favor and aid in whatever the petitioner desires. Another popular folk saint is Rey Pascual whose image is a skeletal figure holding a scythe, often resting one foot on a globe signifying death’s dominion over the world. He is sometimes dressed in a gown and almost always wears a tin crown. One of the figures displayed in Treasure of the Maya Spirit has actually been carved from a bone. Founded on October 25, 1990 by Wilbur Garrett, retired editor of the National Geographic Magazine, La Ruta Maya Conservation Foundation is organized as a nonprofit in the United States under the laws of the State of Virginia. In Guatemala, it operates a fully owned subsidiary, Fundación La Ruta Maya, registered as a nonprofit with the Ministry of Interior. Fundación La Ruta Maya (Guatemala) is the only private organization in Central America that promotes and manages the recovery of archaeological property that left the country illegally in the past decades, with the purpose of repatriation to Guatemala. Its vision is to foster a society concerned with the rescue and conservation of its cultural values by educating the new generations to preserve them in a sustainable manner and its mission is to recover, preserve, study and exhibit its archaeological collections, support museums, publish academic documents, and implement educational programs. Xipe Projects, a museum and non-profit educational foundation, is home to the Peter and Roberta Markman collection of masks and popular art. Xipe Projects now houses approximately 4000 objects, many of which have been previously exhibited by museums, university and commercial galleries. The Foundation serves to disseminate information and stimulate interest in Latin American masking and popular art through conducting and underwriting research that will be presented in publications, lectures and seminars; exhibitions of material drawn primarily, but not exclusively, from the Markman’s extensive collections; and acquiring, conserving and publishing information about the masks, costumes, dance paraphernalia and popular art of various Latin American traditions. Masks of the Spirit: Image and Metaphor in Mesoamerica, published by the University of California Press, and The Flayed God: The Mythology of Mesoamerica, published by Harper Collins. Masks from his collection have been exhibited at numerous venues and are included in numerous publications. Alison Heney, Curator and Asst. Director of the Markman Collection at Xipe Projects, received her PhD from the Department of Comparative Literature at Binghamton University in New York and has done extensive research on the symbolic language and aesthetic forms of collective ritual and cultural performance throughout southern Mexico and Guatemala. Her 2006 field research in the villages of Nahuala, Totonicapan, and Santa Lucia Cotzumalguapa was sponsored in part by the Tinker Foundation for Latin American Studies with some research in primary sources graciously provided by Gio Rossilli.